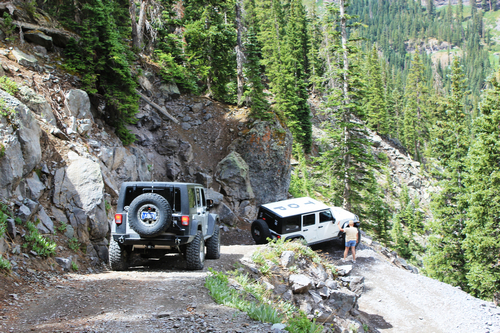 Black Bear Pass is one of the best known Jeep trails in the State. It has a reputation for killing people. 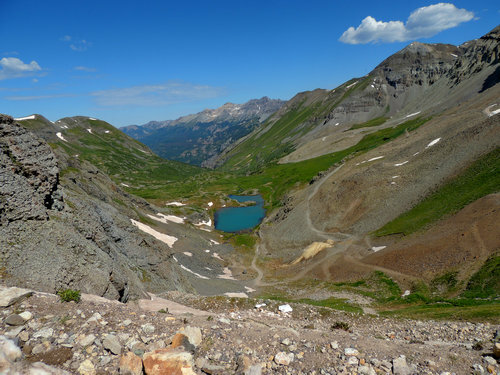 It is possible to die on this trail, but that is true for most of the trails in the Rocky Mountains. You have to be careful and use common sense wherever you are. This is an easy 3.0 rated trail, but if I gave "Pucker Factor" ratings this one would be off the chart your first time down. Scenery is great. 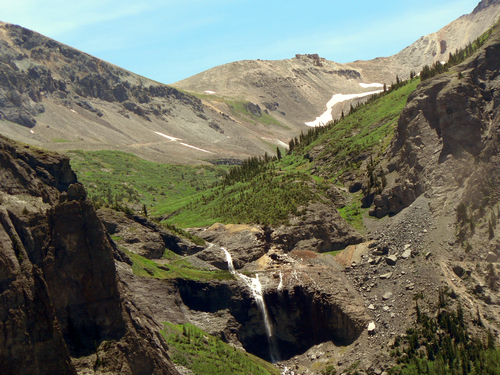 There are two significant waterfalls, nice views of the San Juans and an overview of Telluride. 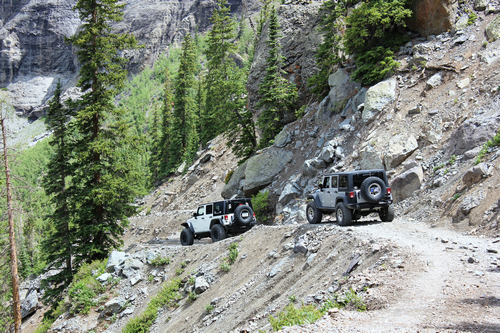 The trail is two-way as it begins on US 550, but switches to one-way at the point it gets narrow and scary. There are very few spots wide enough to pass from here on down. Let me take you on a photo tour of the trail. 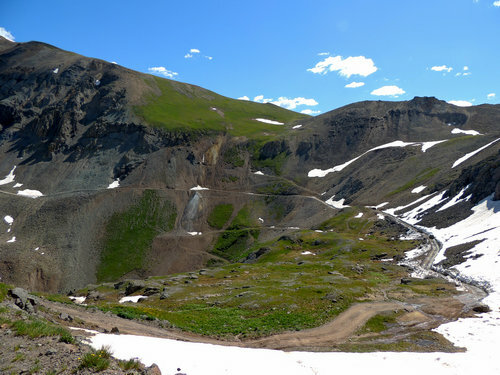 The road from US 550 to the actual Black Bear Pass is another beautiful Rocky Mountain road. 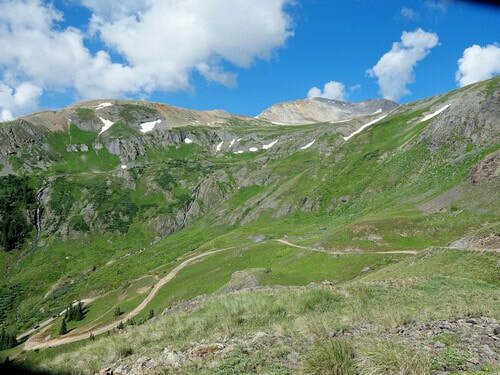 There is a spur road at timberline that leads to Porphyry Gulch, then the trail goes up, up and up toward the pass. As you top the pass the road drops down into the upper basin. 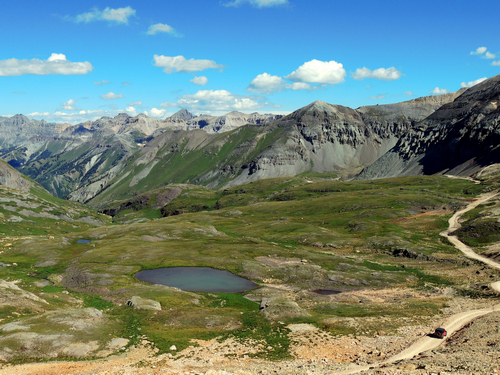 You then drop from there into a still lower basin. Then drop into yet a third basin. 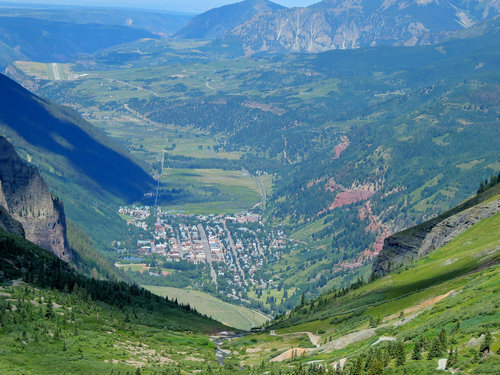 After the edge of the third basin the road drops steeply toward Telluride. At the bottom of this drop you reach a sign indicating that the trail is one-way from here down. 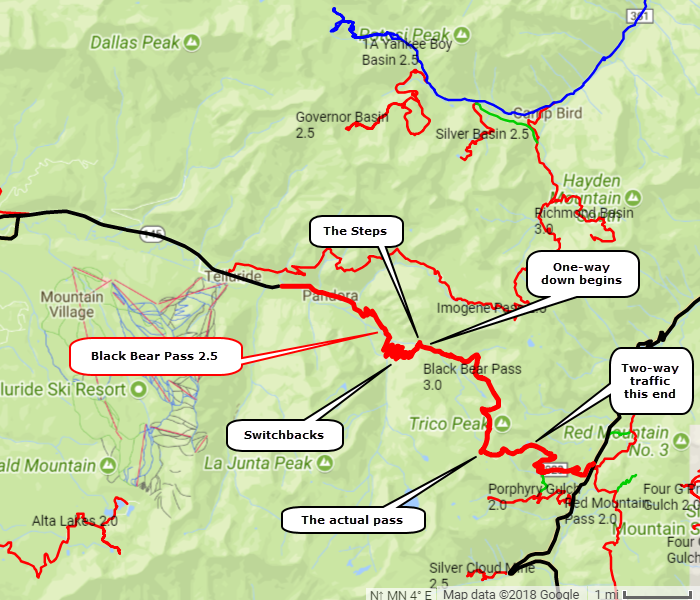 You will soon reach the worst "Pucker Point" of the trail. This section is called "The Steps". The road is solid ledge, but it is a bit off-camber, somewhat narrow and there is a big drop on the driver's side. This is the scariest part. Be careful. Think about what you are doing and you will be OK. Remember, tour companies take tourists down this. OR, you can do what I did - let your wife drive so you can take photos. Regain your composure and continue down the trail. You will come to the waterfall shown in the lead photo on this page. Take a break and get ready for the rest. Shortly after the waterfall is the narrowest spot on the trail. I do not have a photo, but it is another pucker point. Again, tour companies do it all the time. 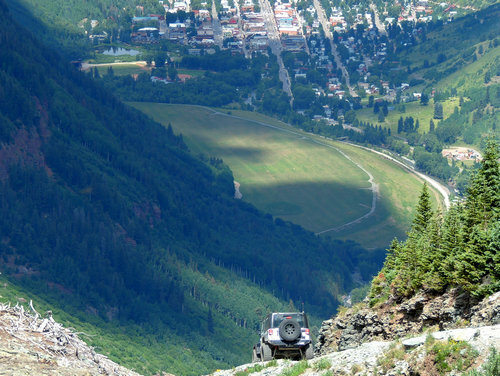 Your next adventure is the famous switchbacks. The first, and sharpest, one is shown in the next photo. All the switchbacks are sharp, but not nearly as bad as their reputation. Make sure your vehicle is actually in reverse before you release the brake! 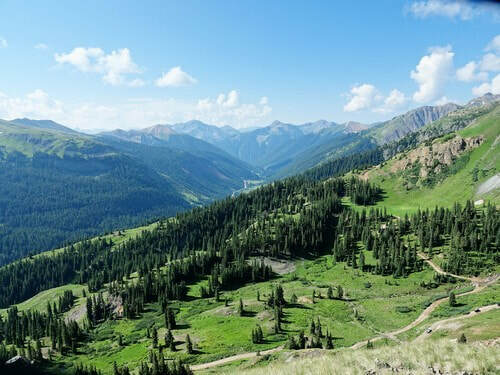 Enjoy the trail and brag about it to your friends that have not been down it. Now that you have read our version of the trail, watch this hilarious You Tube video.